When The Bottle Imp very kindly invited me to review The Speak House, I did not imagine it would be such a fiendishly difficult task. Of course, it is always difficult to review literature in general, and poetry in particular, but in this case there were additional complications that made the text both more appealing and more elusive. 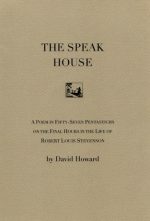 The Speak House (henceforth SH) is ‘a poem in fifty-seven pentastichs on the final hours in the life of Robert Louis Stevenson’. As is well-known, Stevenson died of a brain haemorrhage on 3rd December 1894, at his home in Vailima; immediately after accusing pain in his head while he and his wife were preparing dinner, he fell unconscious for two hours: the author of SH reports the paragraphs in which, in a letter to her sister, Stevenson’s mother summarises how the events unfolded. When people enter a coma like that, there is no way of knowing what they can actually see, hear, feel or think. However, it is a commonplace statement that, as death approaches, one’s whole life flashes before one’s eyes, and this is exactly what SH attempts to represent: Stevenson’s thoughts, the recollections and impressions that flow through his mind as life is about to leave him. Given this starting point, it would be difficult to expect a highly cohesive, well-organized sequence of images and ideas — quite the opposite, in fact. SH offers a collection of snatches of dialogue, comments and suggestions which certainly make sense, but in a rather unpredictable way. On the title page and among the pentastichs there are five woodcuts taken from Stevenson’s own Moral Emblems and Other Poems (London, Chatto & Windus, 1921), and the presence of these small, black, apparently incongruous figures also contribute to the sense of oddity pervading the situation — in line, perhaps, with Stevenson’s last worried question, “Do I look strange?”, which seems to imply fear of a sudden, inexplicable and perhaps irreversible change both in looks and in health. The text also includes more or less clear references to Stevenson’s works, especially Treasure Island and The Bottle Imp, a quotation from which is also an epigraph on the title page. The closing lines then seem to evoke Requiem‘s famous ending ‘home is the sailor, home from the sea / And the hunter home from the hill’, with the image of one last wave before an endless ‘and then’. The sense of darkness that this blank emptiness leaves behind is all the more emphasized by the huddled events that are both in the foreground and in the background throughout the rest of the poem. Life in Vailima, with its political confrontations, is sketched in the summary ways for which an insider, such as Stevenson had become, would need no explanation. Present-day readers, however, are helped in this respect and others by a series of endnotes. Life in Scotland also features at various points in the text: being from ‘a family of engineers’, the dying Stevenson mentions a lighthouse in his last pentastich, but there are also references to Edinburgh, such an important setting both for his biography and for his works, whether fiction or non-fiction. The ease with which certain references may be understood may or may not be a function of how familiar readers are with Stevenson’s life and works; some are more opaque than others, but I think that — in this case — a reviewer commenting on how easy (or difficult) it is to read SH would probably mislead readers, hence the difficulty of the task to which I referred at the beginning of this contribution. Bearing in mind the two hours that SH is meant to represent, looking for clarity would be beside the point: after all, one does not look for clarity in instances of the so-called ‘stream of consciousness’. Instead, what may be appreciated is the attempt to favour proximity with a well-beloved author even at a time when we know we are about to distance ourselves from him forever. In a totally different context, Robert Burns1 wrote ‘Ae fond kiss, and then we sever / Ae farewell, alas, forever’. What we have here is one final glimpse of Stevenson’s ‘beautiful mind’ before we sever, though we know it will not be forever, because literature grants memory, if not — as Shakespeare argued — immortality. It would be misleading to say that this is an easy or a difficult poem, but then again life itself is not easy; Stevenson often illustrated the complicated traits of apparently peaceful situations, not least in that memorable chapter title “Dr Jekyll was quite at ease”. When we sit down to read poetry, we may be ‘quite at ease’, but perhaps we may not be so for too long, and that is exactly the point that literature (and life) often make. The Speak House by David Howard is published by Cold Hub Press, 2014. Marina Dossena is Professor of English Language, and Head of the MA programme in European and Pan-American Languages and Literatures at the University of Bergamo (Italy). She is the author of Scotticisms in Grammar and Vocabulary: Like Runes Upon a Standin’ Stane? and co-editor of Letter Writing in Late Modern Europe.